When I was growing up there were some absolutely ridiculous things that I wholeheartedly believed in. Like ghouls and ghosts, and that pulling the blanket over my head would protect me from the creatures lurking under my bed. But I’m no longer afraid of the dark, nor do I believe in such silly things that my dad had to repeatedly tell me just weren’t real. He also told me that fairies, mermaids and unicorns weren’t real either, but we all know that's not true. There are two things we're sure of and will always believe: kids love birthday parties and they can't get enough of unicorns. So inspired by the completely real and totally existent unicorn, we thought we’d put together and show you how to make the perfect unicorn cupcakes using fondant and simple techniques. Because the only thing better than birthday parties and unicorns, is a unicorn-themed birthday party. Check out the video below on how to make these gorgeous cupcakes. They're so fluffy and delicious I’m gonna die! We started by piping butter icing onto our cupcakes. Remember to make your icing thick and creamy so that it holds its shape. We would also let it set before adding the fondant so that all your goodies stay in place. We used fondant but if you struggle to find it, some stores sell gum or sugar paste. Once you’ve created the horns and ears, you may want to add a little unicorn magic by coating them in edible gold or silver dust. This makes it that much more magical and dare I say, realistic and believable? The kids will be fascinated by the glitter and sparkles! We added silver sparkles to our cupcakes but just as you could dye your butter icing and fondant with a drop or two of colouring, you can also use lots of different colour sugar, spice and everything nice to top off your cupcakes. It’s that simple to make these magical cupcakes but if you leave them out in the sun this summer, even the mystical quality of these unicorn cupcakes tends to lose a little bit of its shine. Be sure to put them in the fridge until the time of the party to make sure everything stays in place! And voilá! 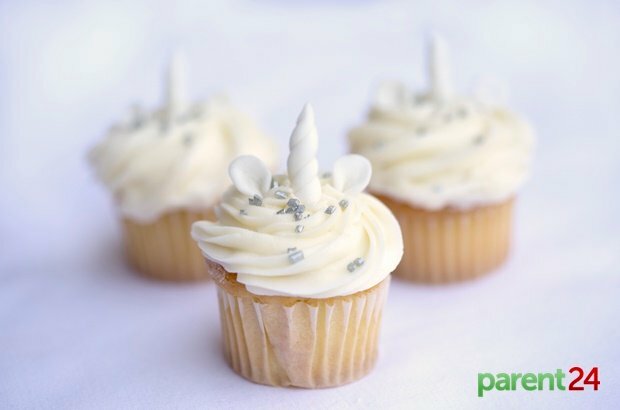 You’ve got yourself magical unicorn cupcakes perfect for that mythical party theme! WATCH: How to make fluffy unicorn poop! Try playing around with fondant and send us your comments and pictures of how it came out to chatback@parent24.com. We may just publish your pictures!